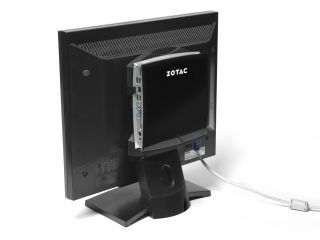 Components specialist Zotac is spreading its wings with the announcement of a nettop PC range called MAG, which is apparently short for mini all-in-one giant. Yeah, we're confused by the mini/giant thing as well, but the specs of this small form-factor, low-power PC are easier to deal with. The Zotac MAG comes complete with Nvidia Ion GPU, and either the dual-core Intel Atom 330 or a cheaper single core Atom 230 CPU, 2GB DDR2 RAM and a 160 GB HDD, all in a rather compact 186mm x 189mm x 38mm case. "As users start equipping every room in their house with computers for a true networked digital home experience, space and power conservation becomes an issue, especially for larger houses," said Carsten Berger, Marketing Director, Zotac International. "With the Zotac MAG series, we're providing users with a system suitable anywhere inside a house. "The compact size, performance and energy efficiency makes the Zotac MAG perfect for all computing uses." In a neat and all-too-rare touch, you can choose your own OS from 32 and 64-bit XP and Vista or Linux. The Zotac MAG dual core version will retail for £210.